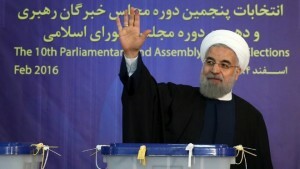 The elections were Iran’s first since international sanctions were lifted in connection with a landmark nuclear deal in July, and reformist gains against hard-liners will almost certainly affect Tehran’s efforts to rebound from decades of political and economic isolation. The strong showing by the reformist-and-moderate camp came despite intense vetting that moderates said had excluded many of their preferred candidates, and appeared to be most pronounced in the capital. Rouhani and centrist ex-President Ali Akbar Hashemi Rafsanjani easily won seats in the Assembly of Experts, the chamber of clerics that chooses and supervises Iran’s most powerful official, the supreme leader. In all, reformist-backed candidates claimed 52 of the assembly’s 88 seats, according to the Interior Ministry, including 15 of 16 races in Tehran. In doing so, they managed to unseat several prominent hard-liners, including the current chief of the assembly, Ayatollah Mohammad Yazdi, and Ayatollah Taghi Mesbah Yazdi. But several prominent hard-liners were reelected to the assembly, including Ayatollah Ahmad Jannati, who narrowly clung to his seat. Jannati also heads the Guardians Council, the unelected, constitutional watchdog that disqualified hundreds of reformist candidates from the parliamentary and assembly votes. After the voting, the conservative head of Iran’s judiciary, Ayatollah Sadegh Amoli Larijani, accused reformists of working with “American and English media outlets” to prevent hard-liners from being reelected to the Assembly of Experts. “Is this type of coordination with foreigners in order to push out these figures from the Assembly of Experts in the interests of the regime?” Larijani asked in a statement on February 29, referring to Yazdi’s and Mesbah Yazdi’s election defeats. Reformists had urged voters to cast ballots for a coalition of pro-reform and relative moderate candidates to prevent the reelection of hard-liners and ultraconservative clerics. Interior Minister Rahmani Fazli on February 29 announced a final combined turnout figure of 62 percent among Iran’s 55 million or so registered voters. The parliamentary vote count suggested the best showing there by opponents of hard-liners in more than a decade. None of Iran’s three main political camps — reformists, independents, or hard-liners — was expected to win an outright majority in the 290-seat legislature, known as the Majlis. But reformists, together with moderate conservatives who supported the July 2015 deal curbing Iran’s atomic activities in exchange for relief from UN and Western sanctions, would collectively control a legislative majority if they decided to join forces. Rouhani and Rafsanjani’s allies won all 30 of Tehran’s contested seats in the parliament. Hard-liners, who opposed the nuclear deal, won just 68 seats, down from more than 100. Reports suggested as many as 50 parliamentary races had no clear winner and could require a second-round runoff vote, most likely in April.